Pilates is an exercise method created by Joseph Pilates during the 1920s. Pilates taught his students to develop strength in the center of the body. He called this center, the powerhouse. Once the powerhouse is strong, muscles are balanced, movement becomes efficient, our postures improve, aches and pains disappear. 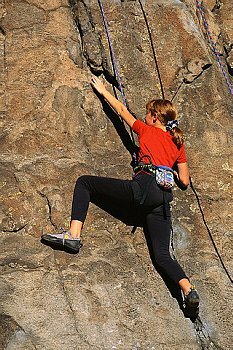 Climbing is an exhilarating sport where flexibility helps you reach further, while muscular strength gives you the ability to manoeuver through tough spots. The margin for error is narrow. Taking a fall may cause injury, or loss of life. No one wants either. Strengthening your core with Pilates makes you a dynamo of balanced power. If you’re thinking about taking up climbing, or are already involved, why not be sure your body is fully prepared for the challenges ahead. Pilates gives you the upper edge on becoming a successful climber, rather than a quitter or someone who is frequently injured. The skills you need for climbing are inherent in Pilates: concentration, breathing, focus, control, precision, flow and stamina. Designed to create mobility and strength, the Pilates method of exercise, teaches mind over muscles, to be as supple as a cat, not to sacrifice knowledge to speed, breathing through all movement, and concentrating on correct form. Posted on August 4, 2013, in Exercise, Pilates and tagged Core exercise, exercise for rock climbers, Joseph Pilates, the powerhouse. Bookmark the permalink. Leave a comment.